One fine morning the Indians woke to the strange news of ‘Bhagavad Gita’ being called extremist literature on the far off land of Siberia in Russia. The news gave a very awkward feeing because ‘Bhagavad-Gita’ in India is as natural and as old as the hills and the rivers and no one ever dreamt of it being labeled anything but noble. We just could not think of this book in terms of extremist or moderate ideology. But such is the compulsion of our times that every word and every action will be dissected on political canons. The age, the context, the origin, the purpose - everything will be sacrificed at the unnecessary altar of political correction. However, the fact remains that extremism and terrorism are twentieth century phenomena. The rigidity of contemporary scholarship and it shortsightedness compel all literature to pass through the acid test of liberalism, extremism etc. Personally I feel that such tests are unnecessary but as said earlier, the compulsions of our times compel us to discuss even a text like ‘Gita’ in terms of contemporary extremist tendency. The word reinvents itself with every age. Every age has its own categories and definitions. The initial hitch regarding ‘Gita’ is its archetypal status. The words of ‘Gita’ have been part and parcel of Indian consciousness since time immemorial. Nevertheless it is a rewarding exercise to put ‘Gita’ to new and newer tests. There is nothing called ‘Hinduism’; there is Hindu philosophy; there is Hindu way of life and thinking. But most definitely there is no ism, no hard and fast code. The absolutely liberal, flexible, tolerant and dynamic spirit of our land implores us not to shy away from discussing ‘Gita’ in this new context. To put the record straight, the objections raised by the local academic community of Siberia are about a book written by the founder of International Society for Krishna Consciousness (ISCON), A. C. Bhaktivedanta Swami Prabhupada. Let us not forget that the reservations have not been raised against the original text. It is an important point to remember. The charges are that the book by the ISCON founder promotes extremism and social discord. It spreads religious hatred and it discriminates on the basis of race, gender, nationality and language. Let us also remember that since the controversy broke, the sales of this book rose exponentially. 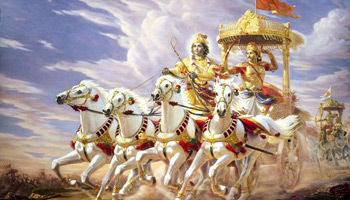 The media for its own sensationalizing, called it a controversy on ‘Gita’ rather than on the book by the ISCON founder. The Indian government asked the Russian government for intervention. The poor Russian ambassador to India apologized over and over again, called it a misunderstanding and even went to the extent of calling the critics, ‘mad men of the Siberian neighborhood’. It is not that ‘Bhagavad-Gita’ is a very mild text; it is certainly not. The common saying in Indian villages and urban households is that ‘Gita’ should not be read by very young minds. It should ideally be read after the middle age. It requires tremendous maturity. It is commonly said that it generates ‘vairagya’ (disinterest in the world). The ninth century intellectual giant from Kashmir, Anandvardhan and his tenth century Kashmiri commentator, Abhinavgupta talked at length about the variations of the same word. The world famous semantic theory of language, popularly known as the theory of suggestion says that the word chages its meaning from person to person, time to time, circumstance to circumstance. The original Sanskrit word ‘Dhvani’ is a much more expressive option than the word ‘suggestion’. ‘Dhvani’ includes suggestion, echo, re-echo, reverberations as well as ambiguity of the word. It is a beautiful philosophy which emphasizes on the mindset of the reader, and the utter importance of commentary. The writer along with the reader creates the text while time, age, context, place and such deep factors keep working in the background. Reading is a creative process. No text is solidified; it is all liquid; it is all flowing. The wise critic, the understanding master of the subject has a role to play. The word has no meaning in its own authority. Every word needs interpretation and that too interpretation in the right spirit. The revolutionary idea put forth by Anadvardhan demolishes all hierarchy. No word is sacrosanct. The word is what one makes of it. Traditionally ‘Gita’ has always been held incomplete without a commentary. ‘Gita’ has always been associated with commentaries of very high standard. Aadi Guru Shankarachrya is held to be an authority on the subject. In recent times, Bal Gangadhar Tilak’s commentary has been considered almost synonymous with ‘Gita’. And I must say that there is wisdom in traditional wisdom. Mahatma Gandhi, Radhakrishnan, Aurobindo – all recent lovers of ‘Gita’ have held Tilak’s commentary to be in the right spirit. The direction of Tilak’s commentary is ennobling. Just as chaff needs to be separated from grain by winnowing, words need constant churning of the thought processes. Extremism as we understand the word today and its offshoot in the form of terrorist activities did not exist when ‘Gita’ was first spoken and recorded in the verbal format. Siberian scholars are making the mistake of applying this contemporary political yardstick to a text like ‘Gita’. When we eat chocolate, we do not measure its sourness. The Siberian scholars are making the mistake of looking for the wrong thing at the wrong place. Great scholarship and literary taste and practice goes into creating an immortal text like ‘Gita’. But equal, if not more, wisdom, care and scholarship are needed in grasping such a work. The context in which ‘Gita’ was spoken was the eternal fight against evil. The conduct of the Kauavas was evil and therefore, Lod Krishna systematically and emphatically guides Arjun to act. As a student of english literature, I am tempted to say that Lord Krishna is that guiding light which hamlet needed so badly. Arjun loses his zest for life and the Lord gives him reasons to live. To live is to act. Therefore, act justly. All standard commentaries on ‘Gita’ have interpreted it as a book of ‘Karmayoga’ ( the rightful practice of action). In the present context, we can say that ‘Gita’ gives us reasons to fight corruption, caste-ism, injustice and bad governance. It does not ask us to fight for the sake of fight. If anyone says that ‘Gita’ provokes violence, it is negative logic; it is ignorant talk; it is doing injustice to the text; it is putting the words in the wrong context. It is not a general exhortation to violence. It is a duty bound, pious and virtuous eradication of evil. In fighting evil, there should be no leniency. The Lord does not ask Arjun to fight for some personal gain or glory. ‘Gita’ says that one has to vigorously fight evil because so is the nature and demand of existence. There is no hint of material advantage. The whole book is at the very peak of thought and idealism. Arjun will act because it is the correct thing to do. remaining the same to success and failure alike. Tilak has emphasized the above shloka for the proper understanding of the text. He has basically interpreted ‘Gita’ as a book advocating self-less action. One has to go on performing the correct actions and at the same time has to remain indifferent to the results of those rightful actions. Going a step further, the shloka says that one must remain in the same state of mind in moments of achievement or in the moments of setback. The ‘sthitipragya’ yogi has to rise above the ordinary and the mundane. The mind has to focus only on righteous actions alone. It is totally unjustified that a book spoken and written on an ethereal level of pure idealism has been dragged into controversy. Due to sheer ignorance, people have equated the book by the ISCON founder with ‘Gita’. The simple solution to this confusion is that anybody interested in the philosophy of ‘Bhagavad-Gita’ should read it with an excellent commentary like ‘Gita Rahasya’ by Tilak. Acceptance of one’s own ignorance and limitations is the first step towards this immortal text. The greatest knowledge is the knowledge of one’s own ignorance. ‘Gita’ leads one to ‘gyan’, awakening. Commentary is the soul of the written text. This is the reason why traditionally, the place of the spiritual teacher is even above God. The spiritual master is the messenger, the harbinger of the divine awakening. Even God needs an able interpreter. The air must be cleared that there is no controversy surrounding ‘Gita’; it is all about the book by the ISKON founder. ‘Shrimad Bhagvad Gita’ coupled with a classic commentary raises the level of consciousness. It makes one look within. It creates better human beings. • Tilak, B.G. 1935. ‘Gita Rahasya’. Poona: Tilak Brothers. • Mukharji, Jogindernath. 1900. ‘Gita for Everyone’. Calcutta: Rupa & Co.
• Desai, Mahadev. 1946 ‘Gita according to Gandhi’. Ahmedabad: Navjeevan. • Radhakrishnan. 1970. ‘Bhagvad Gita’. New Delhi: Blakie and Son India Ltd. The Bhagavad Gita is a philosophy of Man's conduct. It is the collecton of Mantra of code of Conduct for human beings. This book guides a person the way, on which he/she should walk on path of life. The Extremists are fanatic and we must not advocate fanatism in all realms. Param Hansa gives one more meaning ot Gita, i.e. Tyagi. It means live life with detachment. This attitude will minimize one's sorrow. I appreciate the author's attempt. It is well written write-up. Misra Shail. Rtd. Principal of Inter College. "The charges are that the book by the ISCON founder creates extremism and social discord". The are no charges against the actual Bhavad Gita. The ISCON movement is more of a Cult. In the past there were several lawsuits against the movement and its members. The Bhagavad Gita is a non-religious book and does not belong to any particular community. It is like science liberating human mind. It is not any kind of well-tended property not to be trespassed. Its beauty lies in the fact that it is open to debate, discussion and criticism at any point of time or age. Please read "Significance of Gita today" Tribune, 26 December 2002.